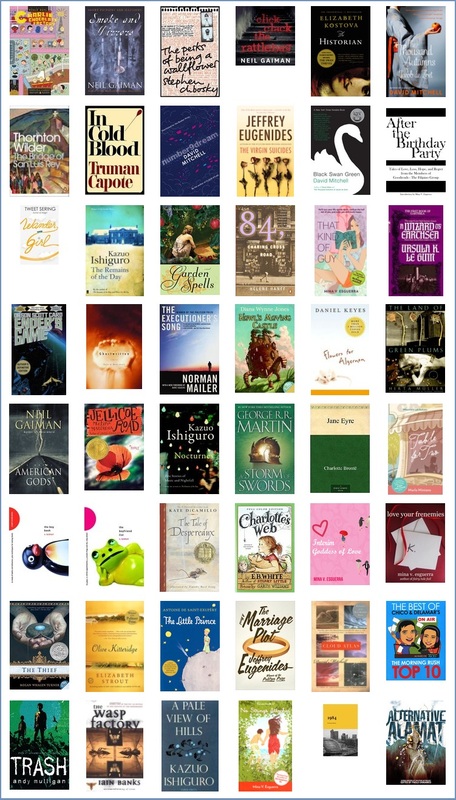 This morning, I checked my Goodreads online shelves and found that I was able to read 48 books for 2012, excluding the one I'm currently reading. In descending order, here are the 48 books, including two rereads (The Historian and The Remains of the Day) and our book club's folio, After the Birthday Party. Cloud Atlas by David Mitchell - What is the ocean but a multitude of drops? A Storm of Swords (A Song of Ice and Fire #3) by George R.R. Martin - The Red Wedding. Made me so mad, I woke my husband at 1 am just to say how pissed off I was. American Gods by Neil Gaiman - A crash course on deities and mythologies. Flowers for Algernon by Daniel Keyes - So heartbreaking, I shed tears. Ghostwritten by David Mitchell - My second Mitchell five-starrer. The Remains of the Day by Kazuo Ishiguro - After rereading it, I thought it deserved 5 stars. Black Swan Green by David Mitchell - My third Mitchell five-starrer. The Virgin Suicides by Jeffrey Eugenides - Eternal flame. number9dream by David Mitchell - My fourth Mitchell five-starrer. The Thousand Autumns of Jacob de Zoet by David Mitchell - The fifth and last book by Mitchell. How can I not give this 5 stars as well? Smoke and Mirrors by Neil Gaiman - I love the short stories in this one! Five Mitchells in a year and five stars per book? Hurray! What a wonderful year in reading that you had, Monique! Here's to more books in 2014!